If you’re an ActiveCampaign customer, you’re going to love this email newsletter tip that will help save hours of time each time you send an email out. If you use another email provider service, you can still follow along and apply your learnings there as well! As a marketer, your day is jammed packed with emails, social media, report requests, partnership management, influencer campaigns, event management and much more! With the constant juggling act, it’s always exciting when we can figure out ways to save hours in our week by streamlining processes and using tools to eliminate redundancies in our work! Brace yourself you’re going to be able to reallocate your hours saved toward more meaningful marketing efforts! Did you know that marketers spend on average 3.48 hours a week sending emails? (3.48 hours) x (52 weeks) = Nearly 181 hours every single year!!! That is an enormous amount of time spent creating and sending emails! Well…what if you could achieve the same results by reducing your time by at least 75%?!! One of the best ways to create your ActiveCampaign email newsletter is through elink.io. elink.io is the smartest way to create visually appealing newsletters by just adding web links! You can just use elink’s Chrome Extension and save any article, product page, website, video, Google Doc…essentially anything with a web link and create a collection. Once you’re done saving content you want to share, make some quick edits, add a header, and the tool will generate mobile responsive HTML email code for you that you can drop into any email marketing service! Bam! It’s really easy, and the best part is elink’s templates are modern and look great on all devices! elink.io provides you an option of choosing any newsletter templates that have been created to be responsive, modern and interchangeable. If you realize, later you want to see how your newsletter looks in another template, come back and update any time. Copy and paste the URL (web link) of any content on the web. elink.io will automatically display the image, a title, and a short description regarding the link in seconds. Imagine no more alt tags, formatting/cropping of images, aligning text and messy HTML code. Choose “Header 1” template to add a newsletter header image and introductory text. This is your opportunity to engage your audience. Now for the EASY PEASY PART. Export your HTML Code to ActiveCampaign! The only thing you need to focus on is creating great email newsletter copy and sharing web links that will keep your audience engaged. Give the stress of email newsletter creation to elink.io. Tell us below how long it takes you to create ActiveCampaign email newsletters via elink.io. We would love to hear how much time you’re able to save! Start creating your 5-minute email newsletters today with elink.io! 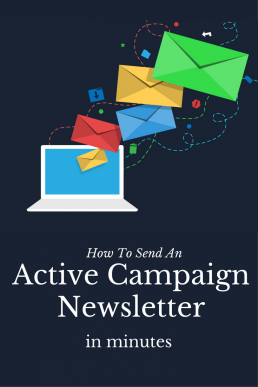 PS: If you don’t use Active Campaign, you can still send out visually appealing Newsletters using Gmail or Constant Contact in minutes with elink.io! Very helpful. I need to send out newsletters. This was so helpful! I feel like they take so much time!!! Very informative and really useful! I’ve just been looking at setting up subscriptions and newsletters for my blog readers. This post is perfect timing and full of so many great tips. Thank you! Thank you for this post. I am looking for good way to start sending emails to my subscribers. This could be it! Very helpful post, I think I’m going to have to bookmark it as a reference. I currently use Mailchimp and noticed there appeared to be a Mailchimp integration as well! So helpful, will definitely look into!! Very helpful and useful post. Plus thanks for helping me save a bit of time. This could very well be a life saver! Thank you! I am in the middle of setting my email marketing up, so this came at a very good time! Thank you for this information, very useful to know that this tool is out there and that it can be used for any email marketing provider! Oh wow this really looks like a quick way in getting your newsletter out in no time. Hi Hannah, That’s wonderful to hear. It’s a great way to add your own personal touch to the content your sharing, but still save you a tremendous amount of time. FYI, elink.io also works with MailChimp as well! That was really helpful! I don’t have some many followers yet but i think it’s time to start using my email list. Hi Sharon, You can use this tool with any email marketing service including MailChimp! Excited to help you save a tremendous amount of time! I was just looking into sending out emails for my small list, so this is helpful thank you! Sending out newsletters always takes me longer than it’s supposed to for some reason. Cutting that email time will really be worth it. And lol those gifs though! Yes! Creating an awesome looking newsletter can take a lot of time. That’s where elink.io comes to the rescue. So helpful! Keeping this article handy! This will be a huge time saver! Thank you for sharing! Interesting. Currently using MailChimp right now but maybe I should check it one out! I love how you shared your screen step by step. No worries! You can create a newsletter using elink and then export it to your MailChimp or Gmail account in minutes! This is great. I’m thinking of starting a newsletter for my blog and this can be of great help. Thanks a lot. Thank you for the helpful tips! This was new to me. And.. I love your dog graphics!! I use mailchimp but I feel like I might switch over to something else. I just want things to be feaster! Wow this is super helpful! And I’m loving all the cute gifs! This looks awesome! I will need to try to check this out! This is really helpful. I only send out newsletters for one of my blogs, which is really bad! !